Every year, hundreds of ALS Advocates come to Washington, D.C., to learn about the latest ALS research, network, and visit Capitol Hill to share their stories with members of Congress and gain legislative victories. This is our opportunity to share the ALS story and let members of Congress know why the time to act is now! 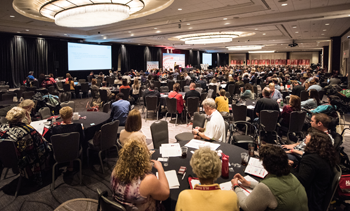 The 2019 National ALS Advocacy Conference is an opportunity for the entire ALS community to unite in Washington, DC. This year’s conference will be held June 9 - 11, 2019. After a day and a half of meetings and training sessions, ALS Advocates from across the country will go to Capitol Hill to advocate with their Senators and Representatives. Conference and hotel registration is now open. Watch this page for updates and announcements – including speaker announcements, travel information, and tips to help you prepare for your conference experience. If you have any questions about the conference, please contact the Advocacy Department at advocacy@alsa-national.org. Please put "Advocacy Conference" in the subject line. Similar to last year, 2019’s conference will focus on The ALS Association's mission. We will be highlighting the latest information and research from our three mission pillars: Advocacy, Research, and Care Services. A more detailed schedule will be available in the coming weeks, but the overview below will help you plan your travel now. • Advocacy 101 for new participants. • Opening session from 3:00 to 5:45 p.m.
• Dinner from 7:00 to 9:00 p.m. for all participants. • Meeting begins at 9:00 a.m. with programming until 3:30 p.m.
Breakfast and lunch provided. Dinner is on your own. Experts in the Advocacy and Research departments will brief participants on critical issues as ALS Advocates prepare for a trip to Capitol Hill. Participants can also visit the Research and Care Services Expo. • Hill visit scheduled from 8:30 a.m. to 5:00 p.m.
Congressional visits will be scheduled for all participants. 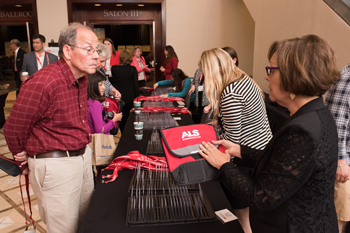 On Monday afternoon at the conference, ALS chapter executives will meet with participants from their areas to strategize for congressional visits. On Tuesday morning, breakfast will be provided and ALS Advocates head to the Hill to educate and advocate with their members of Congress. 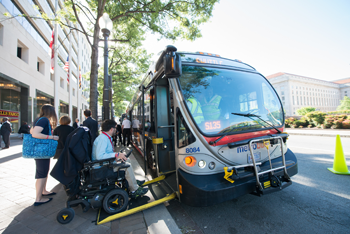 Bus transportation to and from the Hill is available and participants may also use taxis, Uber, Lyft or metro. Association staff will be on hand to answer any questions. The conference will conclude with a hospitality room where you can discuss your day with fellow advocates. To help participants prepare for Advocacy Day, travel to Washington, D.C., and visits to Capitol Hill, a webinar will be held about a week before the Conference. More information will be emailed to all participants. People living with ALS will also have an opportunity to sign up for the ALS Registry at the CDC, if they have not already done so. We will again be providing an opportunity for those people with ALS who have enrolled in the National Registry to contribute saliva samples to the National ALS Biorepository. Appropriate accommodations will be made to maintain the privacy of any individual who wishes to contribute. A highlight of the Advocacy Conference is spending Tuesday on Capitol Hill meeting with members of Congress. Chapter staff will be in touch with participants regarding your schedule for Tuesday. More information will be available prior to the conference to help you research and prepare for your meetings. Conference Registration Deadline – April 22, 2019: Register for the Advocacy Conference by the deadline so you can take advantage of the reduced conference registration rate. Registration fees will double after April 22. This conference is extremely well-attended, so it may be necessary to close registration once we reach maximum capacity. Conference registration fees are waived for people living with ALS and for one caregiver traveling with them to the conference. 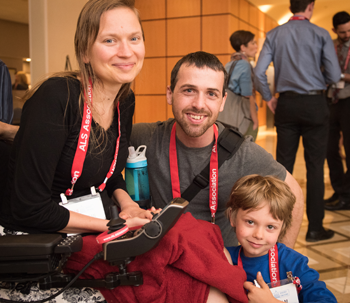 The 2019 National ALS Advocacy Conference has a reduced, non-refundable registration fee of $175 for additional caregiver(s), family, friends, supporters, or staff affiliated with one of our ALS Chapters or The ALS Association. This fee covers a small portion of conference costs, including meals, transportation to Capitol Hill, and briefing materials. Registration fees for children ages 3 – 16 are $25. The registration fee for attendees not affiliated with an ALS Association chapter is $350. Make your hotel reservation here. Hotel Room Reservation Deadline – April 22, 2019: Once you have completed your registration, you can reserve your hotel room following the directions below. The ALS Association has secured a reduced group hotel block room rate which will be available until April 22 or when the rooms sell out, whichever comes first. We will once again be hosting the 2019 Advocacy Conference at the J.W. Marriott Hotel in Washington, DC. All conference activities, except for Capitol Hill meetings, will be held at the J.W. Marriott. Single/double occupancy rate is $289 plus tax per night; $309 plus tax for triple occupancy and $329 plus tax for quadruple occupancy. A maximum of four guests are permitted per room. The J.W. Marriott does not charge extra for children 17 and under in rooms if no additional bedding is needed. While all events will be held at the J.W. 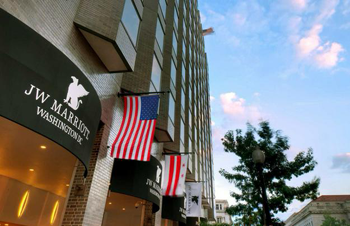 Marriott, we have also reserved ADA rooms at the Willard and Marriott Metro Center hotels. Hotel registration will open around 12:00 PM EST on Thursday, March 15, 2019. Room assignments are not made by the hotel but will be made by Association staff after the attendee has completed a survey specifying their needs. Click HERE for more information. There are a limited number of ADA-certified rooms and, for that reason, an ADA room is not guaranteed. Specific ADA room assignments are based on the needs of the person living with ALS and the availability of rooms that meet those specifications. 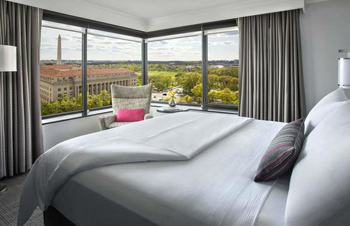 Because the J. W. Marriott has a limited number of ADA rooms, you may be assigned an ADA room at the Willard or Marriott Metro Center hotels. Hotels are not equipped to provide Durable Medical Equipment (DME). In addition, DME companies that provide equipment for conferences are not open on the weekends. Participants must plan for DME equipment well in advance of the travel dates. Participants may rent from any company. As in past years, attendees will be expected to pay the full rental cost for any durable medical equipment. However, the Association will be coordinating one bulk pick-up and drop off for Frederick Medical's equipment, at no charge to attendees. Should participants choose to use a different company, they will need to make arrangements for pick-up and drop off. We recommend renting your DME no later than May 15. Rental equipment, including chairs for the shower and IV poles, should be rented and delivered to the hotel. Advocates may want to rent a wheelchair, even if they do not currently use one, as the day on the Hill involves a lot of walking. If you are renting a Hoyer Lift, you must send an email to adaroom@alsa-national.org, so that the hotel can be made aware in advance of your stay. **NOTE: The Association will also be offering the Lifematters home health nursing service for those who require it, at no charge to attendees. For more information on DME and home health nursing services, please contact Markeya Martin at mmartin@alsa-national.org. Book online at www.delta.com and enter NMS89 in the Meeting Code box provided when using the Advanced Search for flights. Reservations may also be made by calling Delta’s Meeting Desk at 800-328-1111 – refer to Meeting Code: NMS89. Please note there is a direct ticketing fee for booking over the phone with the meeting desk. Book online at www.united.com and enter ZGF2704116 in the Promotion and Certificate box provided when using the All Search Options for flights. Reservations may also be made by calling United’s Meeting Desk at 800-426-1122 – refer to Agreement Code: 704116Z Code: ZGF2. Please note there is a direct ticketing fee for booking over the phone with the meeting desk.